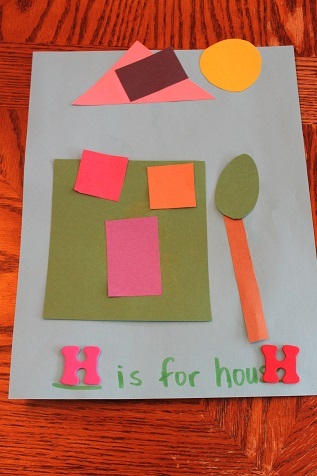 Hunter glued hearts onto the letter H.
He made an H door knob hanger and hung it up on his bedroom door. 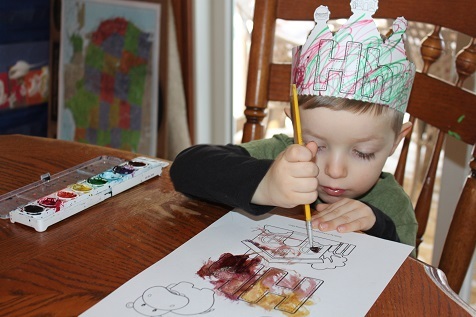 Hunter used Do-a-Dot markers to decorate the letter H.
He painted an H paper while he wore his H crown. 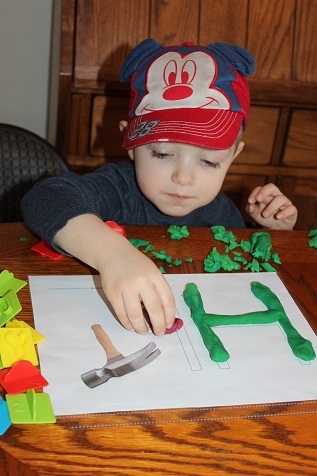 I helped him make a letter H using playdough. 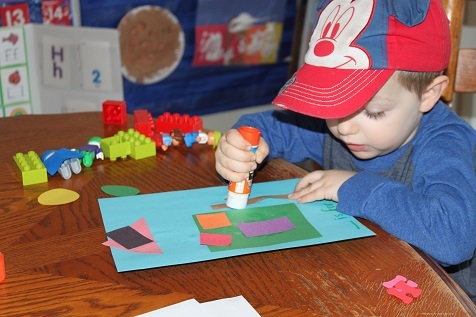 He had a lot of fun making a house. 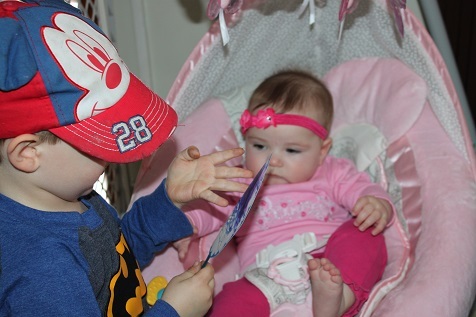 Hunter showed Harper his H wand. 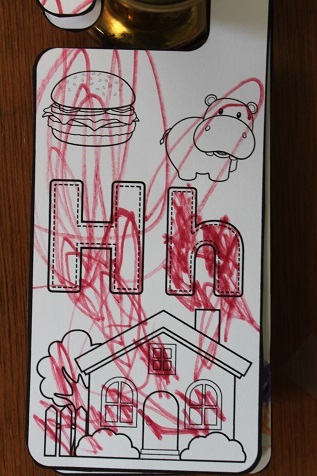 He stamped the letter H onto some paper using paint. 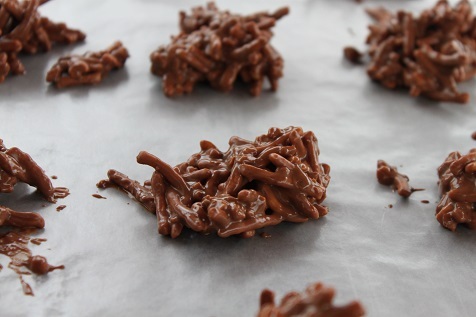 …then he glued the hippos onto the H.
Since Haystacks starts with H, Hunter and I made some delicious haystacks. 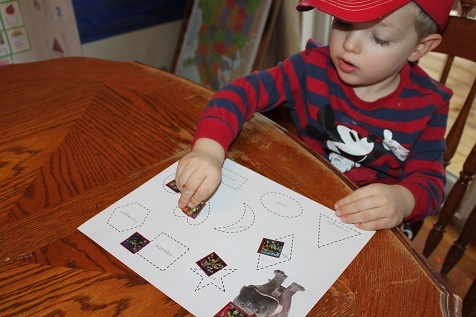 As I called out a shape, Hunter put a Ninja Turtle sticker on the shape I said. 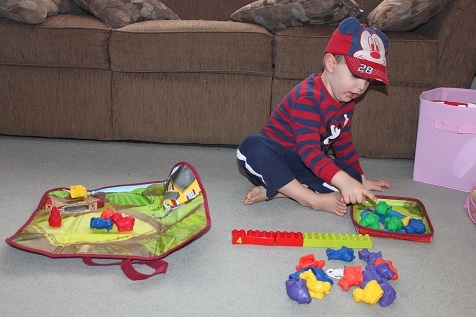 Playing with his Farmland Math set. 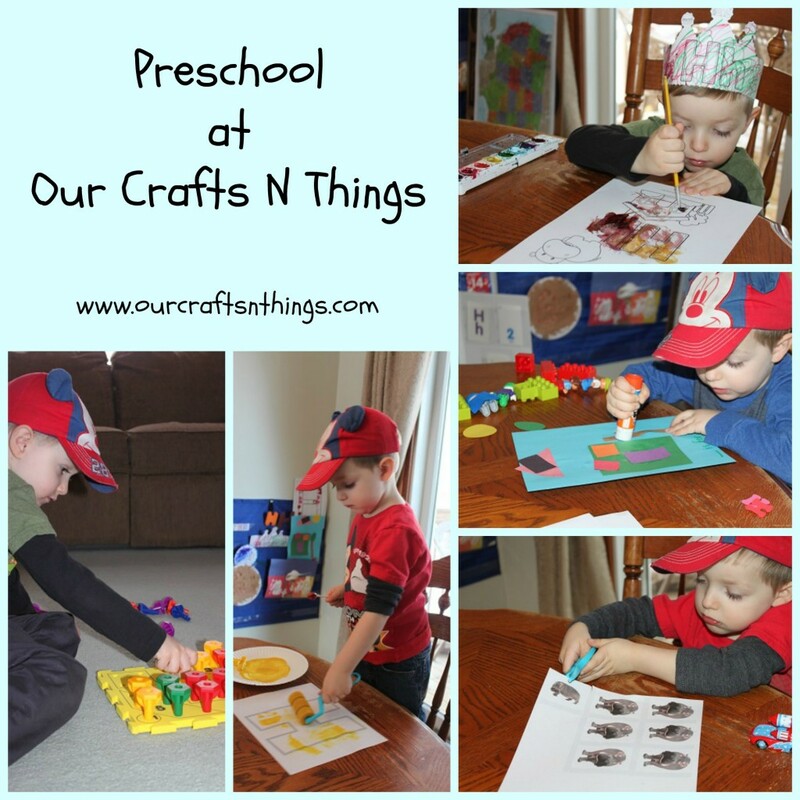 It was another 2 weeks of fun in preschool! 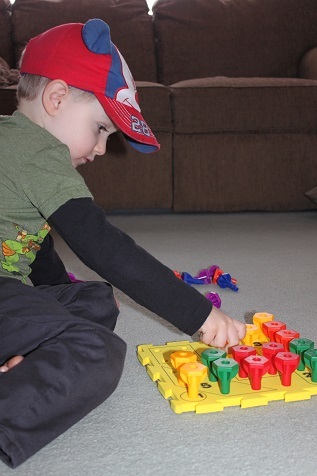 Hunter is 31 months old. 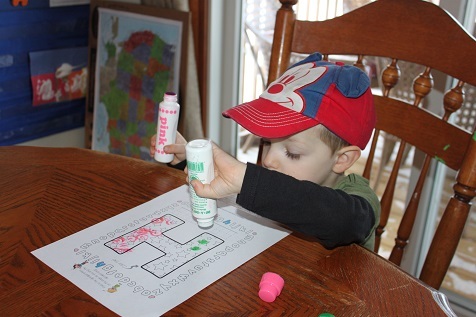 Hunter used colored pencils to color his letter Y paper. 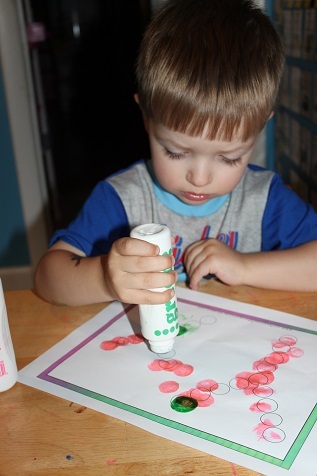 Hunter loves the do-a-dot papers and has gotten pretty good at stamping the circles. 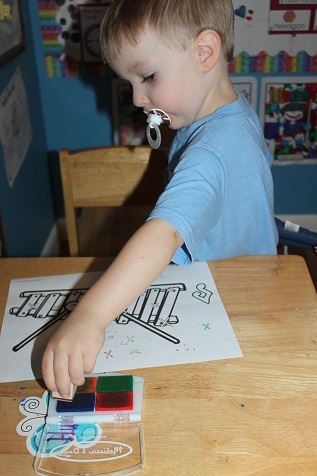 He added some letter Y stamps to his Y paper. 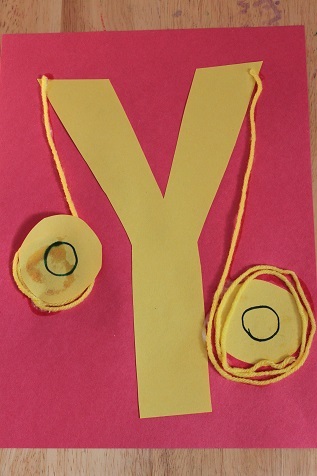 We glued yellow yarn onto the letter Y.
Y is for Yo Yo. 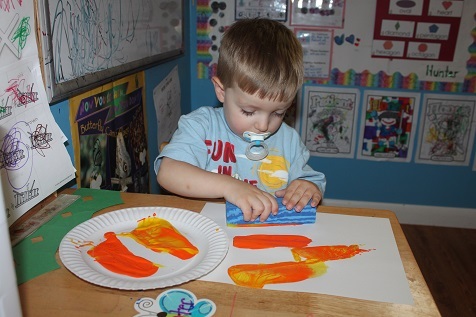 Hunter used water colors to decorate his shape paper. 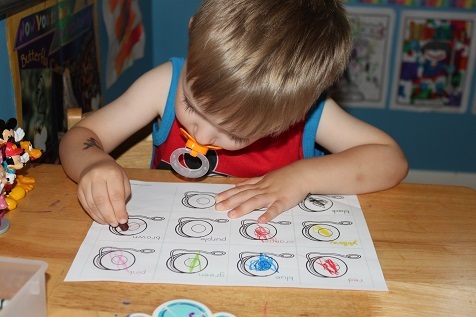 He colored the yo-yos the correct color with his crayons. 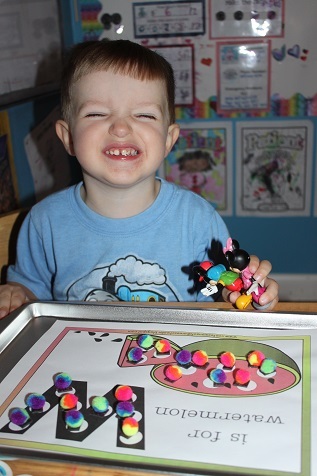 Hunter had beads in his sensory bin this week. 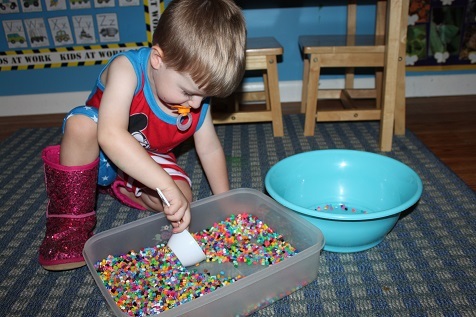 He used a measuring cup to scoop the beads from one bin to the other. 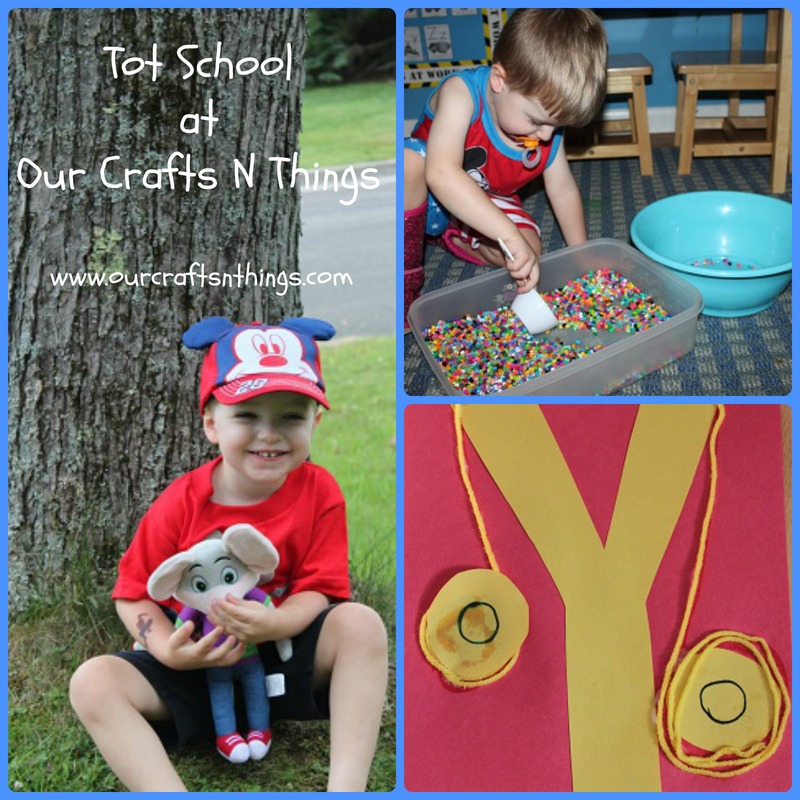 He put magnetic pom poms onto the Y is for Yarn page. The pictures in this post are actually from several weeks ago- and it was the week of our last official day of school for Hailey. 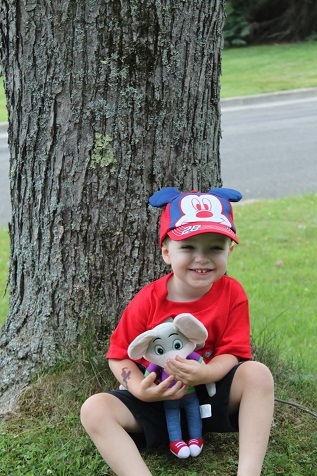 So, we took some last day of school pictures and this is Hunter on our last day of school. 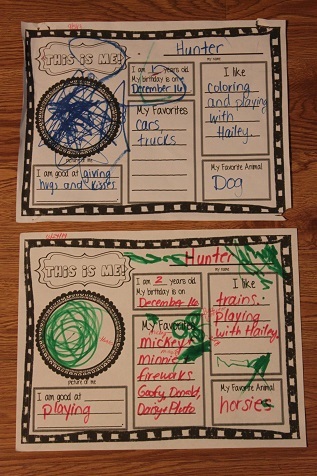 The top paper in this picture is one that Hunter did on our first day of Tot School back in September and the bottom page is the one he did on the last day of school. 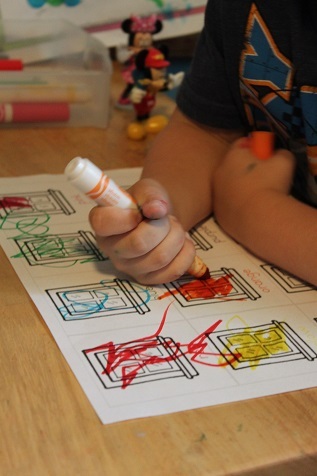 It was fun to compare his coloring and his answers to the questions. 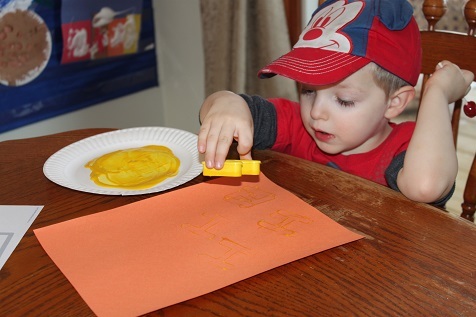 Next week we will finish up the alphabet and then we have some other fun activities to do during the summer (until the baby arrives:-)). 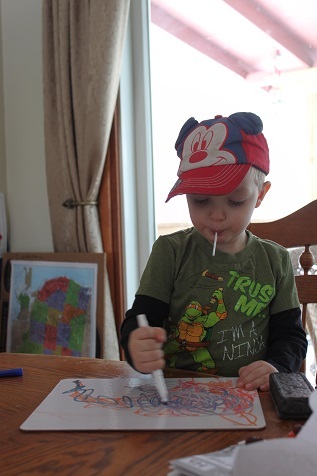 Hunter is 30 months old. 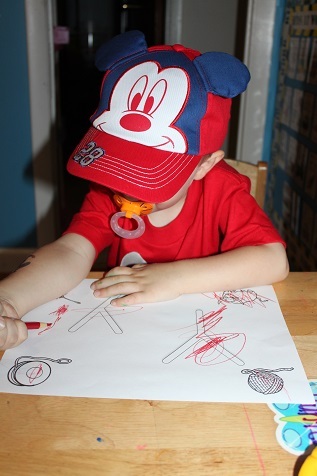 Hunter coloring his letter X paper. 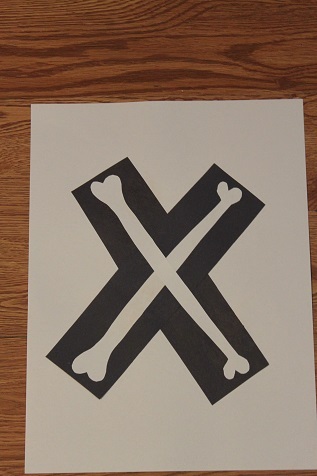 Stamping the letter X onto this paper. 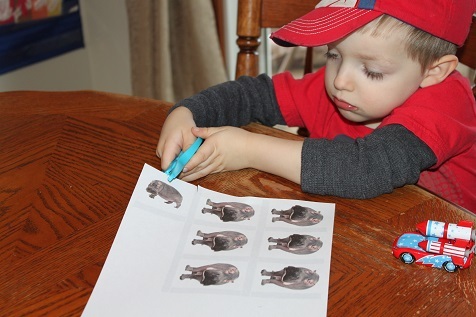 He loves using the stamps! 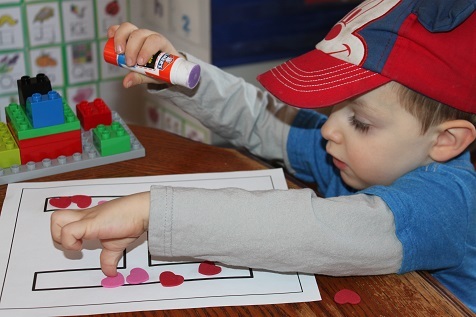 Our shape this week was the rectangle- Hunter worked hard at stamping some rectangles onto his paper. 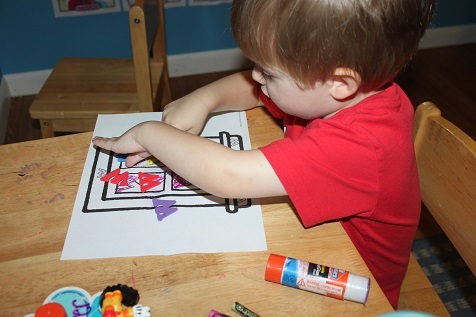 Hunter knows all of his colors, but he really enjoys doing these printables, so we keep using these. 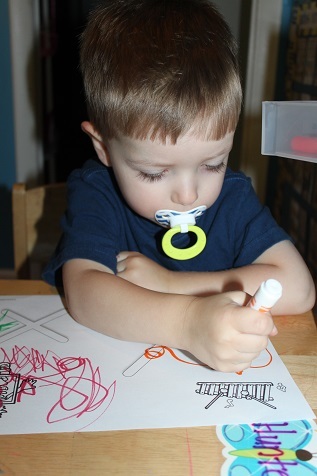 He doesn’t need any help– he looks at the color word and finds the right marker to color the picture. 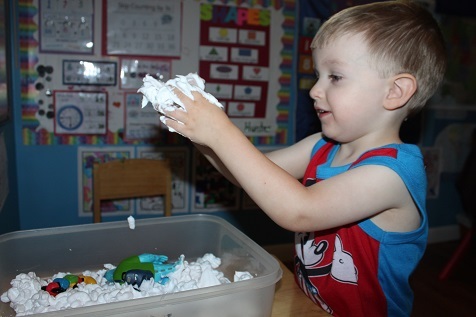 One day Hunter played with shaving cream in his sensory bin. 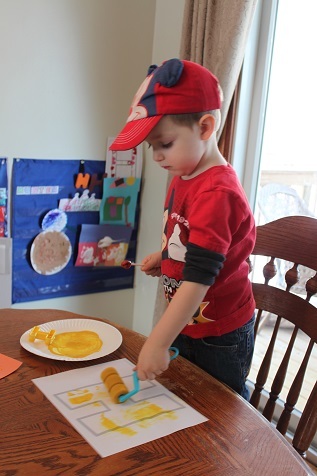 It was a huge mess, but he had a great time. 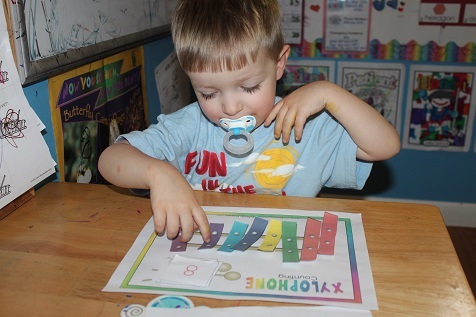 We practiced counting by putting a number on the paper and then counting out the correct number of pieces. 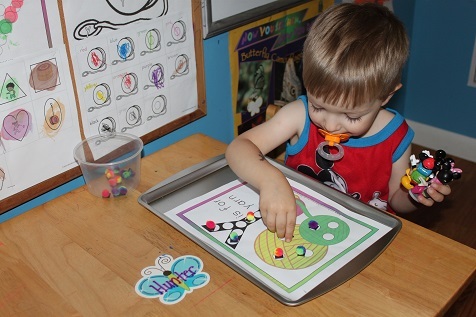 Hunter loves doing the do-a-dot printables for the letters. I have to make sure we do one of these every week. 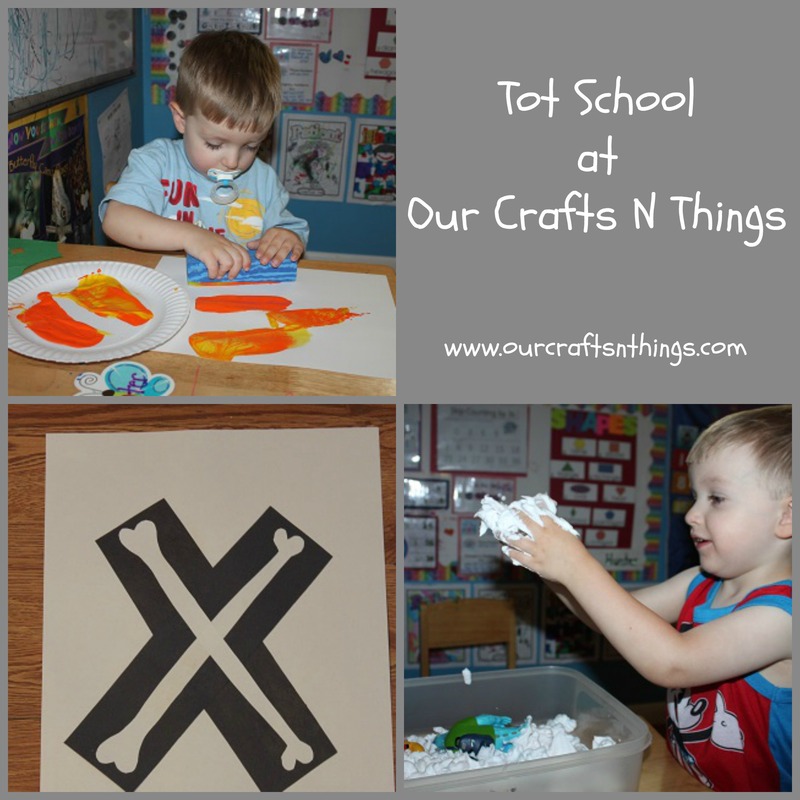 Hunter colored his letter W paper and then glued some foam Ws onto the window. 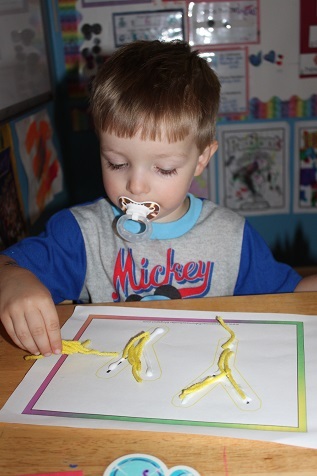 I love that Hunter can do these color papers all by himself. 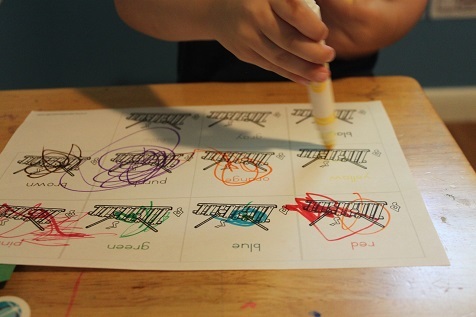 He looks at the color word and then finds the right marker to color with. 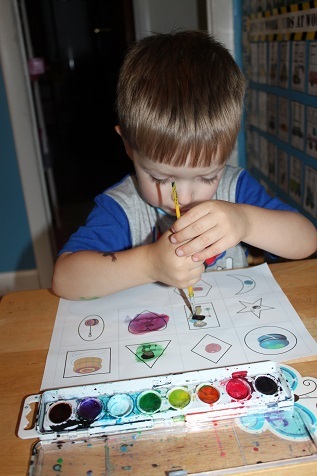 We focused on the triangle again this week- I’ve been doing the same shape for 2 weeks since Hunter does not know all of his shapes yet. 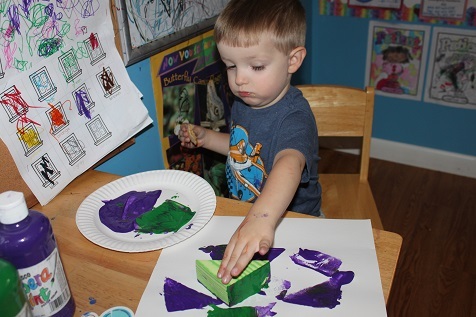 Hunter used a triangle shaped block to do some triangle paint stamping. 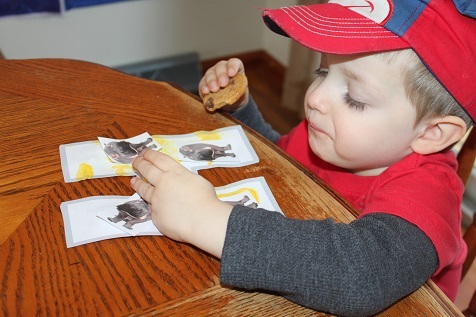 This is another activity that I can just put out on the table for Hunter and when wants to, he’ll just sit down and do it without any help. 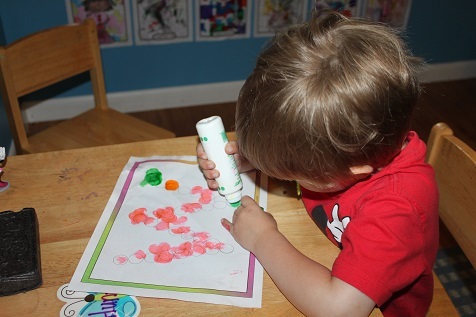 I put the paper onto a baking sheet and then he puts the magnetic pom poms onto the circles. 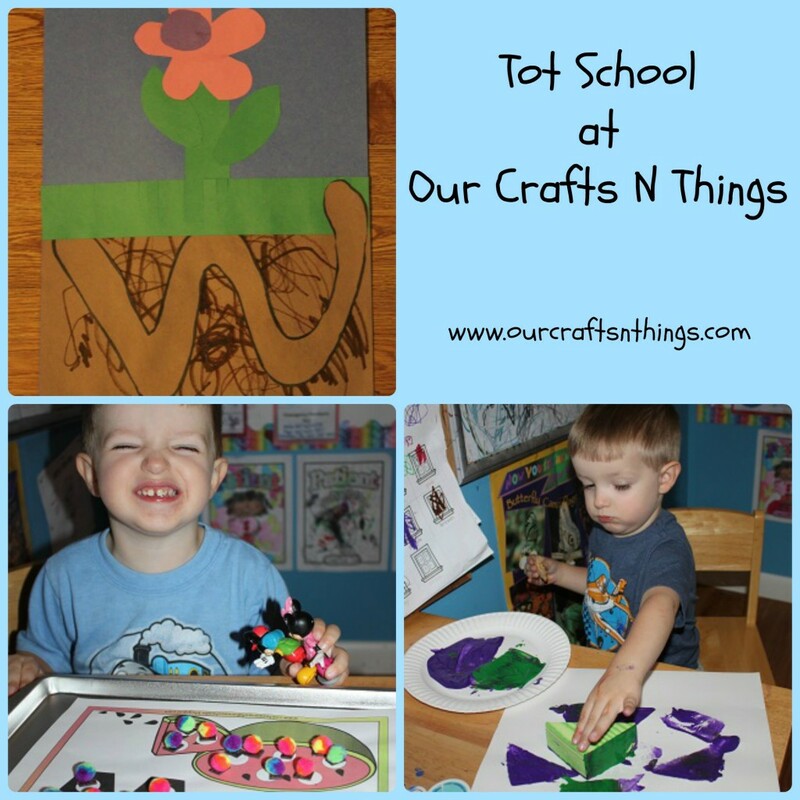 We are continuing out caterpillar/butterfly unit. 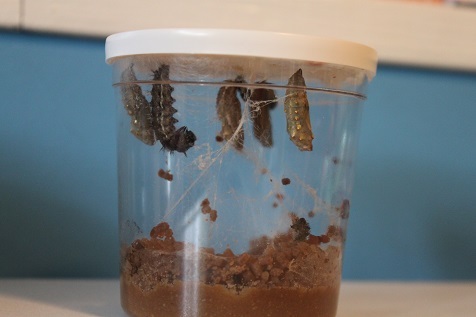 We ordered some caterpillars and watched them grow and then form a chrysalis. Every day Hailey read us a book about butterflies. 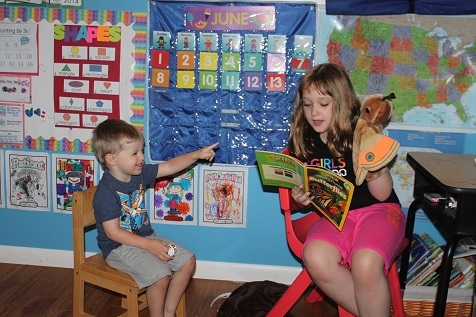 She even used a butterfly puppet when she read on this particular day. 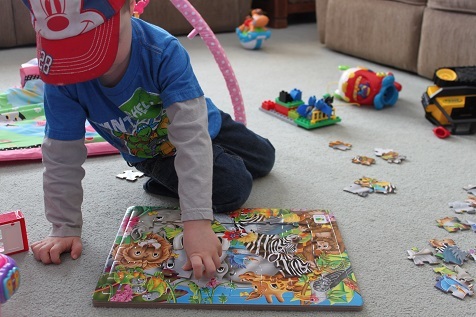 Hunter definitely enjoyed it! 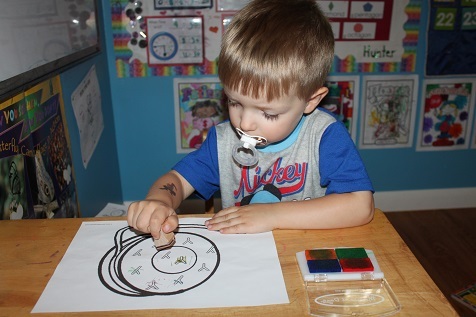 Hailey and Hunter painted one side of a butterfly, then folded the other side over to show how butterflies wings are symmetrical. 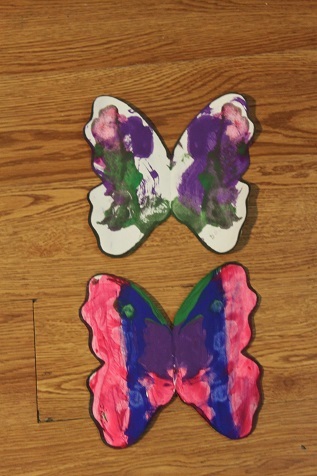 Hunter’s butterfly on the top and Hailey’s on the bottom. 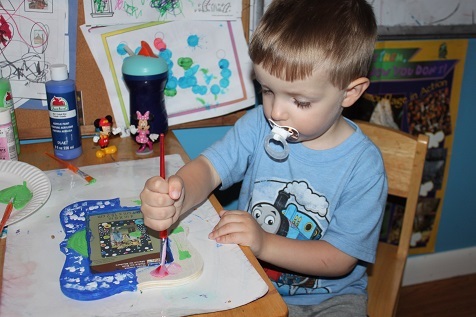 These activities are actually from a couple of weeks ago, I’m behind in my posting- so this is Hunter working on Father’s Day picture frame gift. 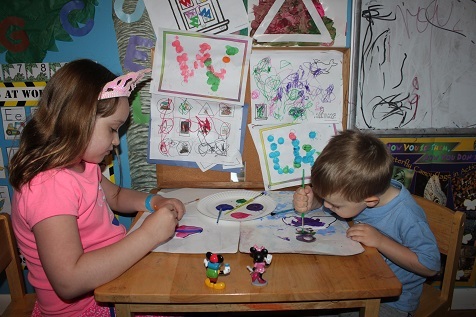 Hailey painted half of it and Hunter painted the other half. 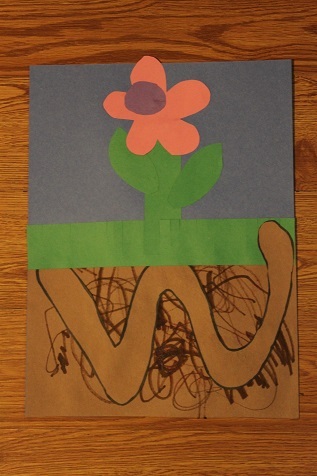 Later they added some scrapbook stickers of tools but I never took a picture of the finished frame.